Night on Broadway is celebrating its 10th anniversary this Saturday. The DTLA arts and music festival runs from 3 p.m. to midnight and is free for all ages. Enjoy four stages, six theaters and hundreds of artists and performances! Here’s the full line-up of events. Broadway will be closed to car traffic between 1st Street and Olympic Boulevard during the festival. 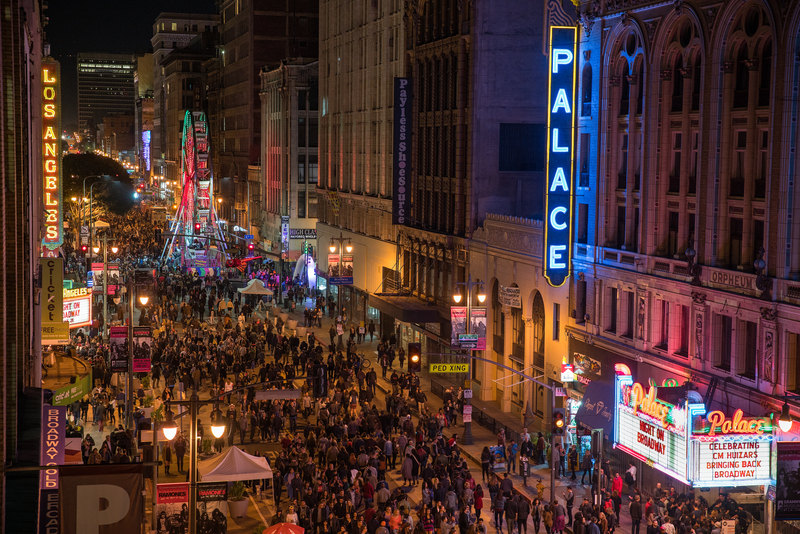 Heavy traffic and parking hassles are expected, so the easiest way to get to Night on Broadway is to walk, bike or take Metro. The Red or Purple Line Pershing Square Station is a very short walk from Broadway. Roundtrip fare is $3.50 in stored value, and you should definitely load your TAP card when you start your trip to avoid lines at the TAP vending machines on your return trip. You can also try Metro Bike Share, which has stations on 3rd, 7th and 9th and Broadway. Check out the Metro Bike Share Station Map or download the Metro Bike Share app to plan your trip by bike. Walk-up bike share trips can be purchased at any Metro Bike station using your debit or credit card. The cost is $3.50 per 30-minute ride. You can also buy a $7 day pass online. In addition to bypassing traffic, go Metro to Night on Broadway to get some exclusive discounts at great local restaurants. All you have to do is show your TAP card to save on your dinner bill. Night on Broadway is organized by the Bringing Back Broadway initiative.